It's tough to find products with ZERO toxins whatsoever these days. Well Everon Lip Balm by Weleda is one, and it keeps my lips moisturized. Everon Lip Balm by Weleda is great relief from dry lips especially during winter season.I only have positive thoughts about my experience with this product. 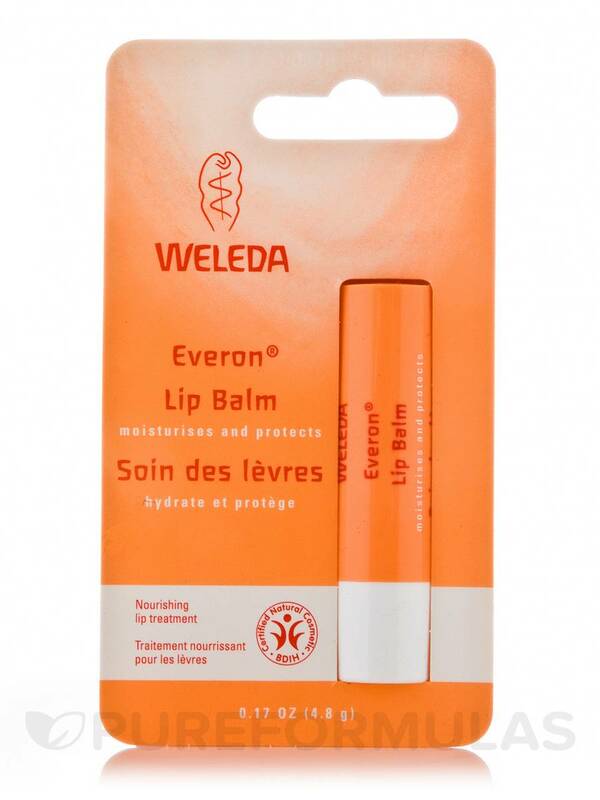 I love Weleda products and this one is not an exception.This Everon Lip Balm by Weleda smells great, works great and I found it to be one of the best lip balms I have ever tried. Give your lips a treat with our all natural lip balm. Soothing and nourishing organic jojoba seed oil in our Everon Lip Balm embraces your lips‚ absorbing deeply to eliminate dryness for a healthy‚ nourished smile. Organic shea butter is an effective‚ skin-smoothing emollient that renders your lips palpably softer when you use our all natural lip balm. Beeswax in our Everon Lip Balm provides long-lasting protection for your delicate lips from skin-damaging environmental influences‚ while rose wax cares for cracks and irritations with its natural antiseptic properties. With healthy‚ nourished moisture and protection ensured‚ you’re left with comfortable‚ kissable lips that have a beautiful reason to smile. Simmondsia Chinensis (Jojoba) Seed Oil‚ Beeswax (Cera Flava)‚ Butyrospermum Parkii (Shea Butter)‚ Euphorbia Cerifera (Candelilla) Wax‚ Rosa Damascena (Rose) Flower Wax‚ Copernicia Cerifera (Carnauba) Wax‚ Vanilla Planifolia Fruit Extract‚ Rosa Damascena (Rose) Extract‚ Citronellol*‚ Benzyl Alcohol*‚ Geraniol*‚ Eugenol*‚ Farnesol*. Everon Lip Balm by Weleda did a fair job of moisturizing my lips. It's very expensive and a very little bit in the tube. 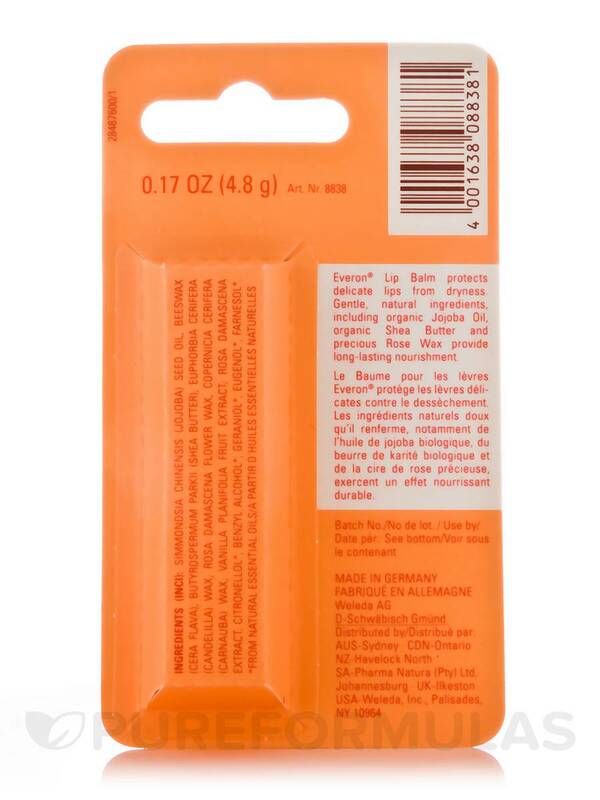 Everon Lip Balm by Weleda smells like a combination of roses and beeswax. Although it is all natural (a plus), it is mostly waxes, so it doesn't really "moisturize" in the usual sense. The consistency of it is a bit harder than most balms, which makes it a little more difficult to apply. I have started using it on top of my other more moisturizing balms and it seems to prolong/seal in the effect of those, so I guess I'll just use it for that. Doesn't moisturize, hard to apply. Everon Lip Balm by Weleda not moisturizing at all. You have to keep reapplying. I find regular Vaseline or cocoa butter out performed this. Too pricey not to perform. Everon Lip Balm by Weleda the smell is heavenly, and it is truly moisturizing. I adore Everon Lip Balm by Weleda! It is the perfect texture, smells divine (very soft fragrance with no weird taste), is moisturizing. I keep one in my handbag and one by my bed. The fact that it has no toxins and it smells good! Because this lip balm is a bit on the expensive side I use it only for night time care. It has a wonderful feel and taste. My lips are content with each application and by morning I have no immediate need for lip balm. Weeks ago I was reaching for the lip care stick upon arising each morning. I will savor this balm.